India and Nepal were the only countries in which a majority of the population was Hindu in 2010, and they are expected to be the only Hindu-majority countries in 2050.44 In 2010, Hindus were the largest religious group in the Asia-Pacific region. By 2050, however, the number of Muslims in the region is expected to surpass the number of Hindus. The annual growth rate of the world’s population is expected to decline gradually in the coming decades, falling from 1.1% in 2010-2015 to 0.4% in 2045-2050. 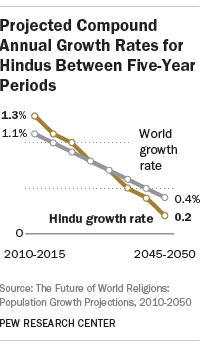 The annual growth rate of Hindus is expected to remain roughly on par with world population growth through 2030-2035, after which it is projected to drop below the worldwide level. By 2045, Hindus are expected to be growing by about 0.2% annually, or roughly half as fast as the global population overall, largely as a result of declining fertility rates in India. Hindus are expected to remain very heavily concentrated in the Asia-Pacific region, where 99% lived in 2010 and a similar proportion is projected to reside in 2050. 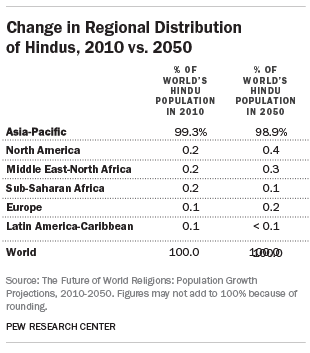 North America’s share of the world’s Hindu population is expected to grow from about 0.2% in 2010 to 0.4% in 2050. Very slight increases also are expected in the percentages of the world’s Hindus living in Europe and the Middle East-North Africa region. Slight decreases are forecast for sub-Saharan Africa and Latin America and the Caribbean. 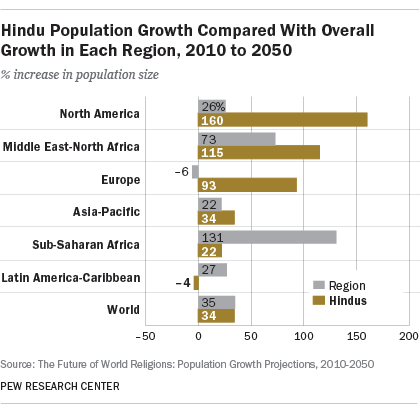 In North America, the Middle East-North Africa region and Europe, Hindu populations are projected to increase both in absolute number and as a share of the overall populations, albeit in each case from a relatively small base. In North America, for example, the number of Hindus is expected to grow from 2.3 million in 2010 to 5.9 million in 2050, rising from 0.7% of North America’s overall population in 2010 to 1.3% in 2050. Between 2010 and 2050, the most rapid Hindu population growth, in percentage terms, is projected to occur in North America (160%), more than six times the expected increase in the region’s overall population (26%). The second-fastest growth among Hindus is anticipated in the Middle East and North Africa (115%), also exceeding population growth in the region as a whole (73%). In addition, Hindu populations are anticipated to grow substantially in the coming decades in Europe (93%) and the Asia-Pacific region (34%). The growth of Hindus in Europe stands out against the backdrop of overall decline in Europe’s population, which is projected to be 6% smaller in 2050 than it was in 2010. 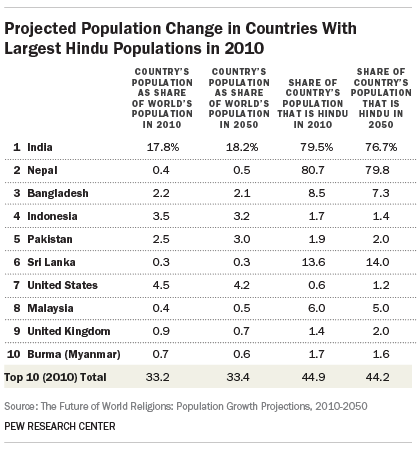 For the most part, each of the 10 countries with the largest Hindu populations is projected to have roughly the same percentage of Hindus (as a share of its total population) in 2050 as it did in 2010. For example, Hindus are anticipated to make up about 77% of India’s population in 2050, down slightly from 80% in 2010. These 10 countries also are expected to account for about the same share of the world’s total population in 2050 as they did in 2010. For example, about 18% of the world’s inhabitants lived in India in 2010, and 18% are projected to live in India in 2050. 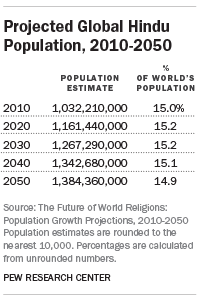 Consequently, the share of the world’s population that is Hindu also is projected to stay about the same (15%). Demographically, as well as culturally and historically, Hinduism is deeply rooted in India, where more than nine-in-ten of the world’s Hindus (94%) lived in 2010. India remains a majority-Hindu country, with about 80% of India’s population in 2010 claiming Hindu identity. As of 2010, more than 99% of all Hindus lived in the 10 countries with the largest numbers of Hindus. Outside of India, the countries with the largest Hindu populations in 2010 were Nepal (24.2 million, or 2% of the world’s Hindus) and Bangladesh (12.7 million, or 1% of the world’s Hindus). The only countries outside the Asia-Pacific region that ranked among the top 10 largest Hindu populations as of 2010 were the United States and the United Kingdom. 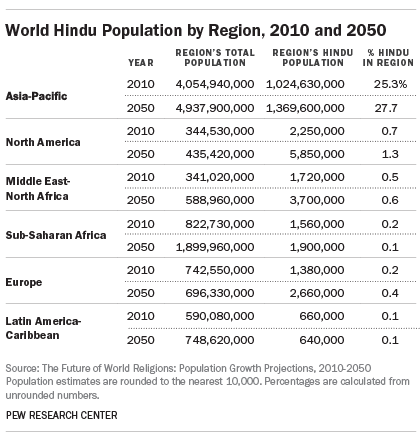 By 2050, the United States – with 4.8 million Hindus – is expected to have the world’s fifth-largest Hindu population. 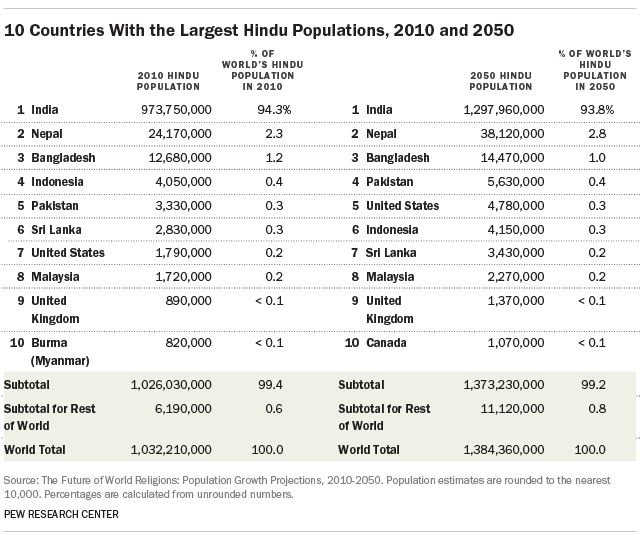 In addition, Canada, with a projected 1 million Hindus in 2050, is forecast to join the list of countries with the 10 largest Hindu populations. As in 2010, India will top that list, followed by Nepal and Bangladesh. With a Total Fertility Rate (TFR) of 2.4 children per woman, Hindus have about the same fertility levels as the world’s overall population (2.5) in the 2010-2015 period. Global fertility among Hindus is above the replacement level of 2.1 children per woman (the number considered necessary to maintain a stable population, all else being equal). Hindu fertility rates are highest in the Asia-Pacific region (2.4) and lowest in Europe (1.5). Between 2040 and 2050, the global Hindu TFR is expected to drop to 1.8, which is below the replacement level and will slow the growth of the Hindu population. 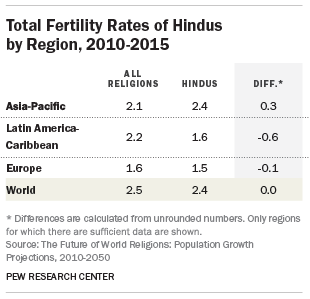 This trend reflects United Nations expectations about future fertility patterns in India, where most Hindus reside. 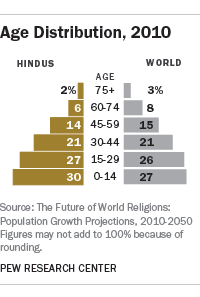 Hindus are younger, on average, than the global population, so the aging of the Hindu population combined with increases in life expectancy will permit the population to increase in number even with below-replacement fertility. 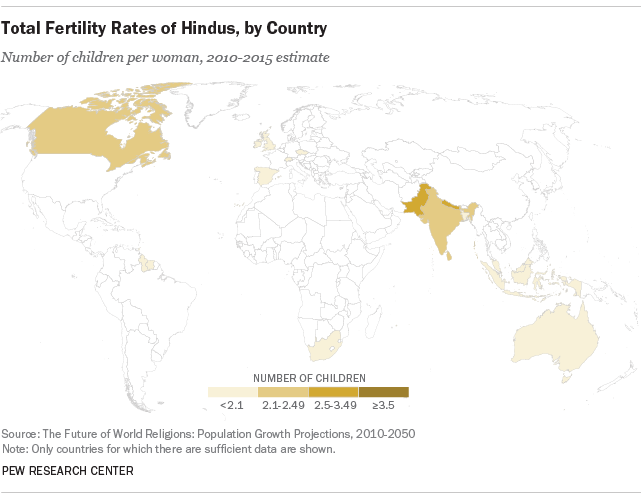 Hindu fertility rates during the 2010-2015 period are 3.2 in Pakistan, 2.6 in Nepal and 2.5 in India. In many countries, Hindu fertility is below the 2.1 replacement level, including Australia (1.7), Indonesia (1.6), the United Kingdom (1.5) and South Africa (1.5). Globally, Hindus were slightly younger (median age of 26) than the world’s population overall (median age of 28) as of 2010. 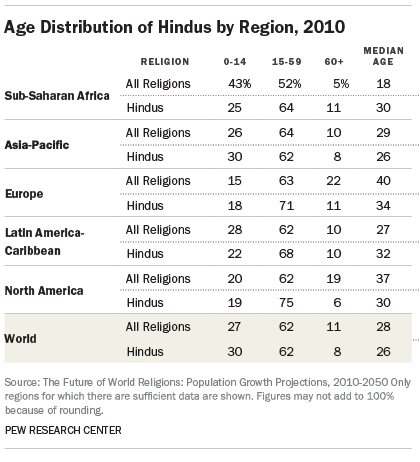 The percentage of Hindus under the age of 30 (57%) also was slightly above the global figure (53%). In the Asia-Pacific region, Hindus also tended to be slightly younger (median age of 26) than the region’s overall population (median age of 29). Mostly owing to a high number of relatively young immigrants, Hindus in Europe (median age of 34) and North America (median age of 30) were considerably younger than the general populations in those regions as of 2010. Religious switching was not modeled in India, home to 94% of Hindus in 2010, because reliable data on patterns of religious switching in India are not available. 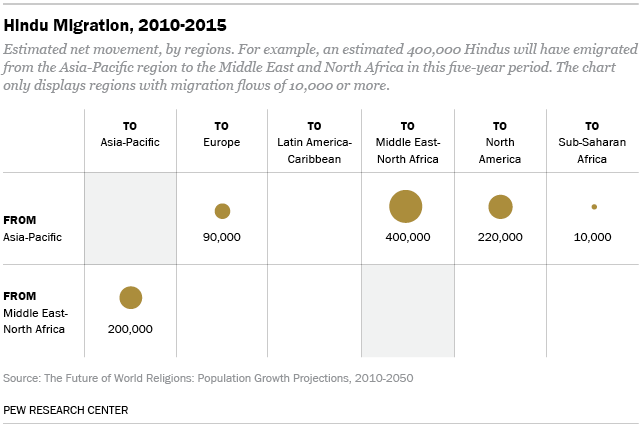 At the global and regional level, religious switching therefore makes little difference in the growth projections for Hindus. 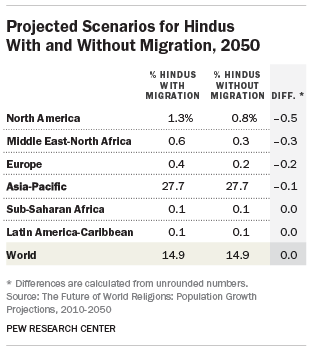 When migration is factored into the projection models, Hindus are expected to make up more than 1% of North America’s population in 2050; without migration, the figure would remain below 1%. Similarly, when migration is taken into account, the expected Hindu shares of the populations in Europe and the Middle East-North Africa region in 2050 are roughly double what they would be without migration.